Happy Mother's Day to all my favorite mamas out there, and especially to my own mom! There are no Hallmark Cards or tear-jerking commercials to remind the Balinese that this is a day to celebrate mothers - I can only imagine how completely strange they would find this entire holiday. In Bali there are daily rituals and countless elaborate ceremonies to honor ancestors, nature, and spirits, but no Mother's Day. I am not complaining. In so many ways, the past eight months of travel have felt like one long Mother's Day for me; all this family time has been a dream, and every day I am grateful to be Otis and Lilah's mom. Okay, now I'm getting all sappy on you! Granitas make me happy - I love recipes that leave room for improvisation while still being reliable in their deliciousness. P, the kids, and I are devotees of this always-refreshing and easy-to-make dessert. Since we hit the road last August and haven't always had the best equipped kitchens, granitas have become our favorite after dinner treat: we made ruby red grapefruit in Northern Australia; pineapple in Fiji; elderflower in New Zealand; and now, lemongrass granita here in Bali. Always curious to see food at its source, P and I took a shady walk along the rice fields just north of Ubud to visit Mr. Nomad's organic veggie farm. There was plenty of lemongrass sprouting and P remarked that maybe we could try growing this fragrant herb at home in Berkeley this fall. Continuing our granita making tradition, I wonder what flavor we will make next month in Corfu when celebrate Abby's birthday. What delights will a Greek Island farmer's market have in June? I cannot wait to find out. Note: Be sure to make your granita at least a few hours before you want to serve it. The freezing process takes a while. Peel outer leaves and rough ends off lemongrass and discard. Rough chop remaining tender inner stalks, making about 1/3 cup lemongrass pieces. Peel ginger and rough chop until you have 2 tablespoons of ginger bits. Place chopped lemongrass and ginger in a medium sauce pan. Cover with 3 cups water. Add 3/4 cup raw organic sugar and 2 tablespoons fresh citrus juice. Bring liquid to a boil, stirring occasionally until sugar is dissolved. After the liquid come to a boil, turn off heat, cover the pot, and let it steep for 30 minutes. Strain liquid, and get ready to freeze your granita. Freezing: Pour liquid into shallow baking pan, or any shallow bowl. Freeze 30 to 40 minutes. Remove from freezer and stir with a fork to break up any frozen bits. Make sure to scrape the edges of the pan, this is where the freezing begins. Continue to freeze for 30 minute intervals. Scrape with fork. Freeze again. After two to three hours of freezing and stirring, your granita will be ready to eat. Once you are ready to eat the granita, remove from freezer and serve immediately. It melts quickly. Try chilling cups, or bowls to help keep the granita frozen longer. 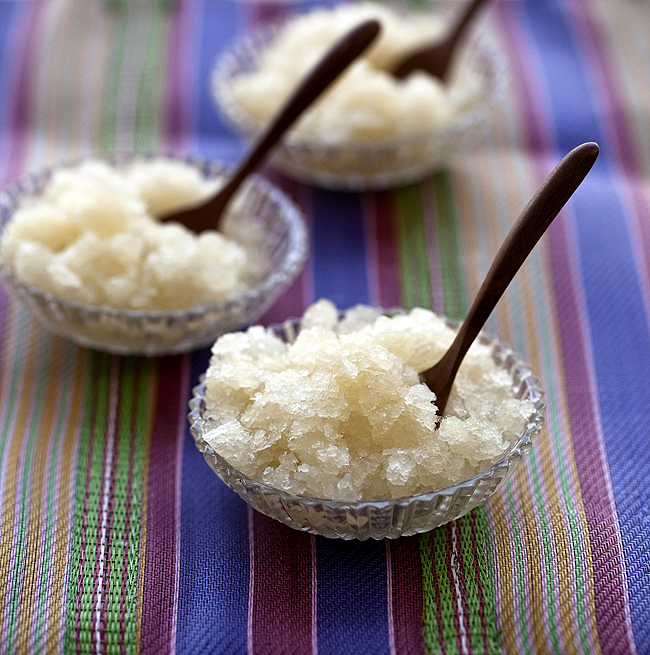 lemongrass and ginger granita sounds delightful, great combination of flavors in such a refreshing dessert. Fresh! Perfect for me since it's 36 degree Celsius here. I really like your blog. Keep up the good work and keep sharing! Leonora, we miss having you guys as neighbors here! I bet Thailand is fabulous. We are heading to Bangkok is just a few weeks ourselves. I have been lovin' following your adventures! Eatlovedrink, such a funny coincidence. I have really fallen in love with lemongrass and am so curious how your gardening experiment goes. Do keep me posted! Great recipe. Love your blog! I wish I had found your blog sooner. Now I just want to be temporarily adopted by your kitchen table (at meal times preferably)! I agree with eatlovedrink, however long it takes the lemongrass to get to my grocery store, it isn't benefiting it... as it no longer looks edible. I grew lemongrass in my North Oakland garden one summer. It didn't make it over the winter, but was gorgeous and tasty during that one season. Go for it everyone! I love your page. The pictures are beautiful, but the design and feel and tone of each individual recipe allows the reader to not only see the food, but you also feel like they can touch and smell the food as well. I pass your site on to all my friends who love food, but also have food allergies as the recipes use ingredients that are "clean". It reminds me of Patricia Wells and Alice Waters of having guidelines and creativity as well when preparing food. Gorgeous photos and granita sounds like just the thing for kids to make for mom on this special day! Thanks for this post. I am loving the discussion on growing lemongrass in the East Bay! Ustabahippie, you give me hope that we can actually sprout a little lemongrass in our own garden. I can almost taste how refreshing this is. I love granitas because they have this "pow'' of flavor that just disappears once they melt away on your tongue. In Bali how prevalent is lemongrass and what other ways have you experienced this ingredient in your travels? Carolyn, you are so right about granitas and that pow of flavor. Great description! Anonymous,I see so much lemongrass here and it seems to be used quite frequently in cooking. I especially love lemongrass skewers for grilled chicken, prawns, etc. 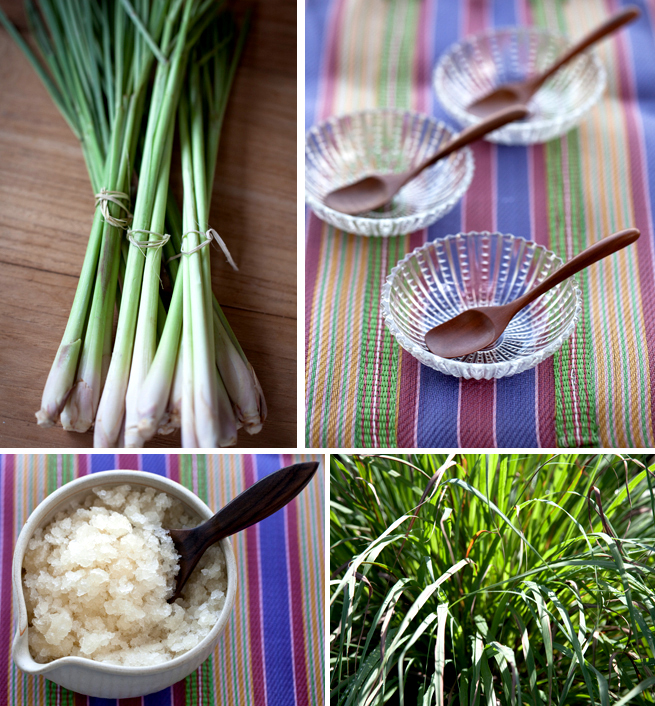 But I have also enjoyed lemongrass chopped and used in marinades. Such a wonderful flavor! happy mother's day! i can't wait to pick lemongrass in your garden! i'm so burned out on ice cream (we've been making it almost every day!). granita is what dash and i are going to make today. strawberry granita. thanks for the inspiration. and such beautiful photos, as usual. inspiring. Phyllis - I hope you had a good mother's day as well. xxxxxooooo to you and your gang! I could do without all those Hallmark cards and tearjerking things myself. The granitas look delicious, very refreshing. I love reading the comments until I get to the point where I can leave my own. Happy belated Mother's Day to you! Making granita is one of the simple pleasures of life. Your imagination seems to be your only limitation. And a lemon-ginger combination is pretty close to perfection in my book. Now what is this about Corfu? My time in Greece, many years ago, was perhaps the most prized of all of my travels. I am so excited for you and am slowly reflecting, savoring every memory that immediately comes to mind. If you are planning to post as you have been doing thus far, it will be these upcoming ones that will probably do me in! wow - that looks so good... heading into my kitchen now and saving this to cookmarked.com for safe keeping! Hello Erin, greetings from Indonesia..
We celebrate Mother's day on the 22nd of December..